Welcome from the Chief Residents in the Department of Anesthesiology, at the University of Florida! 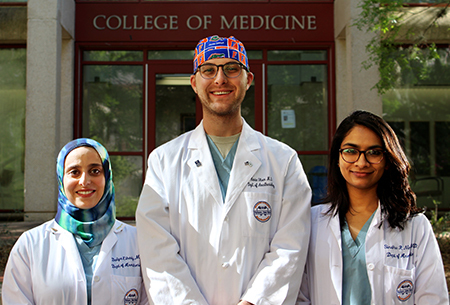 The University of Florida (UF) Department of Anesthesiology Residency is a diverse program with residents coming from the United States and abroad. We currently offer 20 “categorical” positions for residents to match into their PGY-1 year, as well as a number of “advanced” positions for those matching to begin in their PGY-2 year. These advanced spots are mainly reserved for military personnel and candidates who have already completed an internship. Completing residency at UF makes individuals highly competitive for academic or private practice positions as well as fellowship in all subspecialty areas. UF residents graduate from residency with exposure to some of the nations sickest patients, innovative procedures, and newest technology. Our primary training sites are within UF Health, including UF Health at Shands Hospital (North, South, and HVN towers), UF Health Florida Surgical Center (FSC), and Children’s Surgical Center (CSC). We also staff The Malcom Randall Veterans Affairs Hospital, situated in conjunction with the Shands campus. UF Health is a Level 1 Trauma center with 23 operating rooms in the North Tower, 15 operating rooms in the South Tower, 15 operating rooms in the HVN tower, 4 interventional radiology suites, 8 cardiac catheterization labs, 4 dedicated GI-suites, 3 dedicated labor and delivery operating rooms, as well as anesthesiology support for a very busy labor and delivery unit. FSC has 8 operating rooms and CSC has 4 operating rooms. UF Health is also a designated regional burn center with a dedicated burn OR. Additionally, the Department of Anesthesiology has a strong presence in the critical care setting. Residents can rotate through our 30-bed Cardiovascular ICU, 36-bed Cardiovascular Med/Surg Unit, 30-bed Neurosurgical ICU, 24-bed Neuro medical/surgical unit, 48-bed Surgical ICU, 24-bed Pediatric ICU, 8-bed Burn ICU and our world-renowned Congenital Heart ICU. The Malcom Randall VA Hospital, with over 10 operating rooms and its own 18-bed surgical and cardiac intensive care unit, is one of the busiest surgical departments among VA hospitals across the country. In summary, we provide anesthesia for nearly 35,000 patients a year. Our large pool of faculty comes from diverse backgrounds ranging from decades spent in academia to those experienced in private practice anesthesiology. As a result, our residents receive excellent training in all subspecialties of anesthesiology. Many of our award winning faculty members are known nationally and internationally for their exemplary teaching as well as their groundbreaking research and publishing careers. Our program trains residents not only to be exceptional clinicians, but also provides opportunities to work on research and/or quality improvement projects. Life in Gainesville consists of year-round outdoor activities, plenty of sunshine, and a relatively low cost of living. Gainesville is a family friendly, moderately sized city, and the large university offers plenty of activities for residents. Major cities such as Tampa, Orlando, and Jacksonville, as well as world-class beaches on the Atlantic and Gulf coasts, are within a two-hour drive. Since residents average three full weekends off per month at UF Health, there is time to enjoy much of what Florida has to offer. Thank you for expressing interest in our residency program. We invite you to come see firsthand what UF Health has to offer you for your educational and personal growth endeavors.